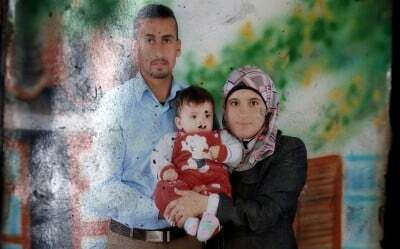 On July 31, unidentified Israeli settlers set the Dawabsha family home ablaze – killing husband and wife Saad and Riham as well as their 18-month-old infant Ali. Four-year-old Ahmed alone survived so far – whether able to recover from severe third-degree burns remains to be seen. At best, he faces months of pain and suffering along with excruciating treatment and rehabilitation, likely remaining traumatized longterm from his ordeal. At worst, he may perish like his parents and brother. Israel gets away with mass murder and occupation harshness unaccountably. Extremist settlers rampage with, committing near daily acts of violence and vandalism against defenseless Palestinians. On Wednesday, Defense Minister Moshe Ya’alon admitted Israel knows who killed Dawabsha family members. Culpable individuals won’t be arrested or indicted, he said – to “protect the identity” of alleged intelligence sources, a ruse endorsing murder, effectively telling extremist settlers they can kill Palestinians with impunity. “All the conjecture and speculations being spread on this issue lack any basis in reality.” Eyewitnesses saw four individuals leave the crime scene – heading for the Maale Efraim settlement. The official lied claiming Israeli security agencies are doing everything possible to arrest and prosecute the perpetrators. They’ve done nothing. The crime made world headlines. Extrajudicially murdering Palestinians is longstanding practice – by soldiers, police, Mossad, other security operatives and extremist settlers. UN figures show they carried out at least 142 violent attacks on Palestinians this year – over 20 since fire-bombing the Dawabsha family home. Accountability is virtually nil. Separately, Netanyahu is in London Thursday meeting with David Cameron and other British officials. A petition demanding his arrest has over 109,000 signatures. Hundreds wanting him held accountable protested outside Cameron’s Number 10 residence. He was officially welcomed as an honored guest – instead of arrested for high crimes against peace. He persecutes Palestinians ruthlessly, wages premeditated naked aggression at his discretion, rejects peace entirely, his claims otherwise long ago discredited as Big Fat Lies. False! He categorically rejects peace, wages daily war on Palestine, won’t negotiate – instead demands unconditional surrender. Earlier peace process initiatives were dead on arrival each time. Decades of futility define them – the greatest hoax in modern times. Israel and Washington deplore peace. Violence and instability serve their agendas. Palestinians have no say whatever, no rights, no security in their own land – brutally controlled by a foreign occupier. Nothing in prospect suggests change. Israel and extremist settlers will continue getting away with murder. Palestinians legitimately defending their rights and well-being are called terrorists. World leaders support Israeli high crimes by indifference and inaction. Palestinians continue suffering – with no end to their ordeal in sight.